So, I’m in the United Kingdom, good ol’ Britain! The last time I was here was for a 6-week study abroad program in London in the summer of 2012. I absolutely LOVED the city, so I obviously had to come back and visit. But there was one thing that I knew I needed to do. For those who don’t know, I am a massive fan of the BBC show “Doctor Who.” In Cardiff, Wales, there is a Doctor Who museum, and that, my readers, is what today’s post is all about. Enjoy! I woke up pretty early, unfortunately, because my roommates turned on the lights and opened the curtains promptly at 7am. They were all from South Korea, so I don’t know if this is typical or not. I had to get up by 7:45 anyway, so it wasn’t too bad. Why did I have to get up so early? Well, the night before, I bought a bus ticket to Cardiff for the day! Yes, I was going to spend 3 hours on a bus (3 hours each way, mind you) JUST to visit the Doctor Who Experience in Cardiff. I have no regrets. None whatsoever. I was able to sleep on the bus for a little bit, thankfully, and listened to some podcasts I’d downloaded hosted by some YouTube personalities. When I arrived at the bus station in Cardiff, I jumped off and headed to an ATM. I realized I didn’t have any pounds with me. I needed to take a city bus to get the the museum, and luckily the museum’s website had directions on how to get there. The bus dropped off right in front! I waited in line for the bus, and when it arrived, I saw that it only took exact change. Uh oh. All I had were twenties… The bus driver looked at me and asked, “Are you on your own?” When I said I was, he smiled, nodded his head, and said, “Just take a seat.” Okay, Welsh people are very friendly. When the bus made it to the museum, I thanked the bus driver profusely and he just smiled and said, “Have a great time.” I love kind strangers. When I saw the museum, a huge smile came across my face. I was finally there! I walked inside and bought a ticket. The girl at the counter turned out to be from Arizona. We spoke about how we both don’t particularly like the cold weather in Europe. I got in line with a few other families and waited for the tour to begin. It was really cool! It was an interactive experience, where you pretend to be on a mission with The Doctor. And it had been updated so that the 12th Doctor (the current one, for those who are unaware) lead you through it. I felt like a little kid. You faced the Doctor’s biggest villains and I actually got the chills from being scared… After the interactive portion was over, we were lead into a room with many displays and costumes from the show’s past 51 years! Very cool! I took a lot of pictures, many of which I didn’t even put on Facebook, but here are a few photos of me! I don’t want to bore you all, especially if you aren’t fans of the show. This is the interior of the 9th and 10th’s Doctor’s TARDIS, his spaceship/time machine! A Weeping Angel, one of the scariest monsters on Doctor Who, if you can believe it! Cybermen, another one of the Doctor’s biggest foes throughout the years! There were displays of how they looked from their first appearance to their most recent! The front door to the TARDIS! The Silence, one of the more recent monsters in Doctor Who! I spent a good hour just walking around and looking at the displays and reading the descriptions. It was nice to go at my own pace and see everything, although I know there are many of my Whovian friends who would’ve really enjoyed coming with me. After I finished walking around, I went to the gift shop, bought a keychain, and then sat down in the cafe. I ordered a cappuccino and a scone with jam and cream. I felt British. There was wifi, so I took hold of it and figured out my next move: real food! I hadn’t actually eaten more than a protein bar and a scone that day, so I searched for my favorite British chain: Nando’s Chicken! It turned out there was one just a few blocks away! I walked along Cardiff Bay, where the museum was located, and took in some of the sights. While it was chilly outside, it was a pretty nice day and was lovely to get a little exercise in (as if I hadn’t gotten enough from my weeks of walking around already!). I found the Nando’s, sat down, and had a yummy chicken wrap for lunch. The host was very friendly, and we chatted a bit. Like I said before, Welsh people are nice. I then walked back to the city center, because I had many hours to kill before my bus back. It was a half hour walk back, so I went at a nice pace. 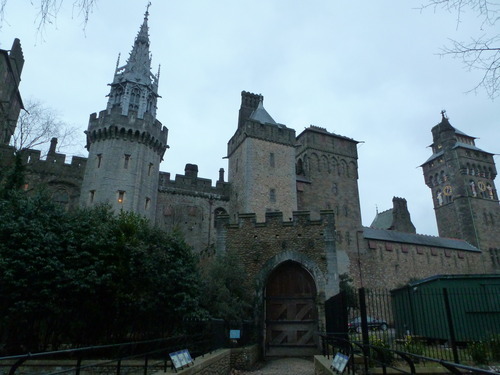 I headed towards the Cardiff Castle, but unfortunately it was closed. I chose to walk around the Royal Gardens instead and get some shots of the castle from the outside. As I headed towards an exit, I found that the gate was locked. Uh oh. I started to walk back towards the way I came in and ended up chatting with a girl named Caitlin from the Netherlands. She was studying urban planning at Cardiff University! She was very sweet. When we got back to the way we entered, we found that gate locked as well! Luckily, there were some people still working in the gift shop who let us walk through to exit. He informed us that the gardens closed at 5 (it was 5:30pm). A bit odd that they lock the entrance to a park. Oh well. Caitlin and I parted ways and I headed to the bus station to switch my ticket for an earlier bus back. Luckily the switch was only a few pounds extra, so I paid the fee and hopped on the bus back to London. I don’t know what else I would’ve done for a few hours in Cardiff. It was a nice town, but definitely more of a daytime kind of place. I returned back to the hostel safely and settled in for a well-deserved night of sleep. 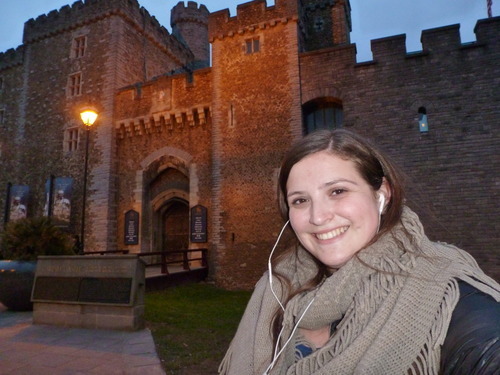 So happy I got the chance to visit Cardiff! Definitely worth it, although it was a long way on the bus to go for just a day. Oh well. Can’t wait to tell you about my time in London!